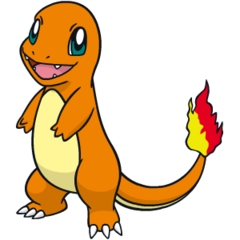 X The flame on its tail indicates Charmander’s life force. If it is healthy, the flame burns brightly. X La flamme sur sa queue représente l’énergie vitale de Salamèche. Quand il est vigoureux, elle brûle plus fort. X La llama de su cola indica la fuerza vital de Charmander. Será brillante si está sano. X La fiamma che Charmander ha sulla coda indica la sua forza vitale. Se è in forma, la fiamma è vivace. X 꼬리의 불꽃은 파이리의 생명력의 상징이다. 건강할 때 왕성하게 불타오른다. Y Depuis sa naissance, une petite flamme brûle au bout de sa queue. Si cette flamme s’éteint, la vie de ce Pokémon s’éteindra elle aussi. Y Este Pokémon nace con una llama en la punta de la cola. Si la llama se apagara, el Pokémon se debilitaría. Y Dalla nascita una fiamma gli arde sulla punta della coda. Se si spegnesse, per lui sarebbe la fine. Y 태어날 때부터 꼬리의 불꽃이 타오르고 있다. 불꽃이 꺼지면 그 생명이 다하고 만다. Omega Ruby The flame that burns at the tip of its tail is an indication of its emotions. The flame wavers when Charmander is enjoying itself. If the Pokémon becomes enraged, the flame burns fiercely. Omega Ruby Die Flamme auf seiner Schweifspitze zeigt seine Gefühlslage an. Sie flackert, wenn Glumanda zufrieden ist. Wenn dieses Pokémon wütend wird, lodert die Flamme sehr stark. Omega Ruby La flamme qui brûle au bout de sa queue indique l’humeur de ce Pokémon. Elle vacille lorsque Salamèche est content. En revanche, lorsqu’il s’énerve, la flamme prend de l’importance et brûle plus ardemment. Omega Ruby La llama que tiene en la punta de la cola arde según sus sentimientos. Llamea levemente cuando está alegre y arde vigorosamente cuando está enfadado. Omega Ruby La fiamma sulla punta della coda indica il suo stato emotivo. Se la fiamma ondeggia significa che Charmander si sta divertendo. Quando il Pokémon si infuria, la fiamma arde violentemente. Omega Ruby 꼬리의 불꽃은 기분을 표현한다. 즐거울 때는 흔들흔들 불꽃이 흔들리고 화가 났을 때는 활활 맹렬히 불타오른다. Alpha Sapphire The flame that burns at the tip of its tail is an indication of its emotions. The flame wavers when Charmander is enjoying itself. If the Pokémon becomes enraged, the flame burns fiercely. Alpha Sapphire Die Flamme auf seiner Schweifspitze zeigt seine Gefühlslage an. Sie flackert, wenn Glumanda zufrieden ist. Wenn dieses Pokémon wütend wird, lodert die Flamme gewaltig. Alpha Sapphire La flamme qui brûle au bout de sa queue indique l’humeur de ce Pokémon. Elle vacille lorsque Salamèche est content. En revanche, lorsqu’il s’énerve, la flamme prend de l’importance et brûle plus ardemment. Alpha Sapphire La llama que tiene en la punta de la cola arde según sus sentimientos. Llamea levemente cuando está alegre y arde vigorosamente cuando está enfadado. Alpha Sapphire La fiamma sulla punta della coda indica il suo stato emotivo. Se la fiamma ondeggia significa che Charmander si sta divertendo. Quando il Pokémon si infuria, la fiamma arde violentemente. Alpha Sapphire 꼬리의 불꽃은 기분을 표현한다. 즐거울 때는 흔들흔들 불꽃이 흔들리고 화가 났을 때는 활활 맹렬히 불타오른다. Blue Obviously prefers hot places. When it rains, steam is said to spout from the tip of its tail. Stadium Even the newborns have flaming tails. Unfamiliar with fire, babies are said to accidentally burn themselves. Stadium2 The flame on its tail shows the strength of its life force. If it is weak, the flame also burns weakly. Ruby The flame that burns at the tip of its tail is an indication of its emotions. The flame waves when Charmander is enjoying itself. The the Pokemon becomes enrages, the flame burns fiercely. Sapphire The flame that burns at the tip of its tail is an indication of its emotions. The flame wavers when CHARMANDER is enjoying itself. If the POKeMON becomes enraged, the flame burns fiercely. Pearl The fire on the tip of its tail is a measure of its life. If healthy, its tail burns intensely. 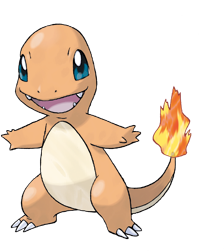 SoulSilver The flame on its tail indicates CHARMANDER’s life force. If it is healthy, the flame burns brightly. White 2 The fire on the tip of its tail is a measure of its life. If healthy, its tail burns intensely.